No need choosing between automatic or manual scanner, you have both in ONE ! 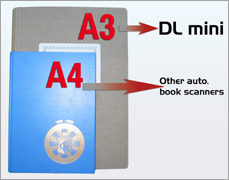 DL mini offers you the largest scanning surface of any automatic scanner. You can scan as small as 2xA6 (2x 4”x6”) and as large as 2xA3 (2x 12”x17”). 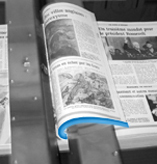 Proven Swiss reliability – it simply works alone ! You can rely on the DL mini to digitize your bound documents with the highest degree of automation for the maximum productivity. This is made possible by intelligent sensors and automatic retry cycles in case of difficulties. Operator may be absent during the process. A high quality, authentic image – simply great ! DL mini’s air-flow page turning process and air cushioned book cradle ensure gentle handling of books without applying pressure or tension on the spine. As easy to use as 1-2-3 ! All you do is place the book on the cradle, choose presets and press “start” in the on-board user menu and DL mini does the rest. 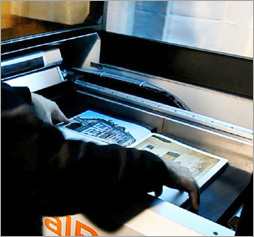 It automatically centers and measures the book at the beginning of the process.